By now, people going into a Despicable Me film expect at least two things: Looney Tunes-style cartoon silliness, and Minions. Since neither works without the other, it only makes sense for both of these standout elements from the first two films to be given its own 90-minute feature film, and just watch the money pile in. 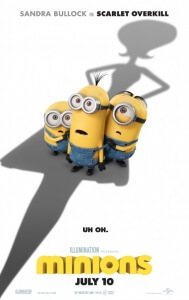 For now, the Minions in, erm, Minions have gotten enough world power that audience interest is virtually guaranteed. But does the film itself give good enough reason for such a huge expected turnout? Whether you’d like this film depends entirely on your own tolerance for the yellow pill-shaped beings known as Minions – if you’re a fan, you’ll be in heaven; if you can’t stand them, you’ll be in hell. For us, they’re harmless enough and funny in all the right ways that make both children and adults giggle uncontrollably, so the movie is tolerable to that extent. As we learn at the start, the Minions are beings that have evolved from yellow micro-organisms which have existed since the beginning of time, and from then they’ve been trying to – and failing miserably at – serving history’s most evil figures from the mighty T-Rex to Dracula (although one wonders how they would have served the likes of Adolf Hitler or Genghis Khan, but we imagine the U certificate stepped in the way of them showing that). After a master-less period leaves the gobbldey-gook speaking creatures depressed, three Minions named Kevin, Stuart and Bob (all voiced by director Pierre Coffin) set out to find the right person for their kind to follow, a journey which eventually leads them to the diabolical scheming of Scarlet Overkill (Sandra Bullock), the world’s first female supervillain. That’s about as much story as we can fathom, because the clear intent is not to bog itself down too much in story or the kind of messages that Pixar would usually apply, it’s just to have the Minions do their thing and tickle us silly with their comedic antics. Anyone looking for something a bit more grounded in terms of plot or character will find themselves underwhelmed (and if you are, don’t worry because Inside Out is right around the corner), but if you want an inanely silly laugh riot then this is just up your alley. From the very first few seconds, and we mean that quite literally, you can’t help but grow a nice big grin from how silly it takes itself, but that’s part of the Minions’ charm, from how they’re animated by Illumination Studios to Coffin’s vocal gibberish with a French dialect for each one of them, they’re the closest we’re probably going to get for a while to returning to Tex Avery-style cartoon characters – and in an era where every Pixar and DreamWorks movie is determined to bog down our throats some kind of message, it’s refreshing to see a feature-length animated film just be what it should be: a friggin’ cartoon. Outside of the Minions themselves – and again, we can’t stress enough that your toleration of this film will depend entirely on your appreciation for them to begin with – there are plenty of laugh-out-loud sight gags, characters and pop-culture references to keep everyone satisfied. As our three main heroes arrive in late-60s New York, an election poster for Richard Nixon boasts “Finally, a name you can trust!”; the soundtrack is filled with rocking 60s hits by the likes of The Who and Donovan, with the Minions even belting out their own nonsense versions of the Beatles’ Revolution and the theme from The Monkees; and they even come across a family of criminals, with the mother and father voiced by Allison Janney and Michael Keaton respectively, who have some very funny moments but sadly disappear after a short while, only popping up again for a few brief cameos. Like we said, it’s the kind of film where grounded stories, characters or even logic don’t seem to exist; Minions delivers exactly what it promises, and will be sure to be a treat for fans of theirs from the very first Despicable Me film (and a living nightmare for those that aren’t).